On 31st January 2018, NXT aired its 285th episode of NXT, taped at Wells Fargo Center, Philadelphia, on 27th January before NXT TakeOver: Philadelphia. Our main event saw former WWE UK Champion Tyler Bate compete with Roderick Strong for a future shot at the title that Tyler lost. We also had in-ring action from TM-61, the Ealy Twins, Nikki Cross & Lacey Evans as well as interviews and 'exclusive footage' from the aforementioned TakeOver event. But was it any good? We open on a flashy video package recapping the entire TakeOver event, if you didn't see it, expect to see each match recapped over the course of the show anyway. Quick. Squash. M8. Nikki Cross rushed straight at her opponent hitting a crossbody and pummeling her with strikes. Evans would send Cross out of the ring but Cross pulls her out and just keeps on pummeling, eventually Evans would cut off Cross and work a brief heat section till she misses a second rope moonsault until Cross is back on top, laying into her and hitting the Swinging Fisherman's Neckbreaker for the pin. It could have been a lot better but for the time given, both women looked good. Cross has probably become the most over part of SaNitY and hopefully, it won't be long before she's holding gold of her own. We get video recaps of the four matches that weren't the main event. We also hear from Baszler who claims that she may have not got the title but looking at Moon after the match, she feels more like a winner, and Velveteen Dream who's happy that he won, I think. On their entrance, Shane Thorne jumped into the ring and looked like he had a little stumble, I was worried that he might be about to re-injure himself. Luckily, such fears were unfounded as the former GHC Tag-Team Champions flew right back into competition and literally too as Thorne, seemingly wanting to show people how fully working his legs are hitting a tope con hilo here and a corner cannonball there, Miller also hit a pretty bloody near-perfect moonsault. The Ealy twins haven't been working long and they didn't do much here of anything but they didn't do anything wrong so there's that, plus points here to Mauro for establishing that Gabriel has the right arm tattoo and Uriel the left arm tattoo so now we know. The finish came as they hit Thunder Valley double gorilla press slam for the pin. Not an amazing showing but in terms of reminding us what TM-61 can do, it went a long way. Post-match: TM-61 are on the mic. They say that he documentary they showed the past two weeks told us who TM61 but they are now so much more, they are the mighty and The Tighty, Sixty-One. Also they don't kneel. Video recap of Gargano vs Almas with the standard 'exclusive footage' which as always, is slow-mo and videos they'd put on their YouTube after, worth a watch anyway because this match is that good. 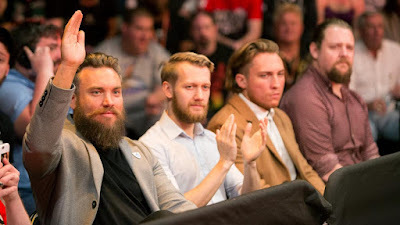 So EC3 was in the front row at TakeOver, so was Trevor 'Ricochet' Mann and War Machine. They'll all be on TV soon enough probably, especially as they were discussed here. Next Week: Adam Cole vs Killian Dain & SAnitY vs Undisputed Era for the Tag Titles. Pete Dunne shrugs off new UK Title Number One Contender, Roderick Strong. Typing or reading this lasts as long as the video. This didn't fully break the post-TakeOver curse, especially not in the same way as the superb Dunne v Gargano match from post-WarGames but it was still fun and it did just enough to suggest bright things are on the horizon in 2018.